Retirement News > Retirement Planning > Articles > Say Hello to PlannerPlus Reporter: Look at Your Retirement Plan in a New Way! Say Hello to PlannerPlus Reporter: Look at Your Retirement Plan in a New Way! We at NewRetirement are happy to announce delivery of some of the most requested retirement planning features: a printable report and downloadable data. 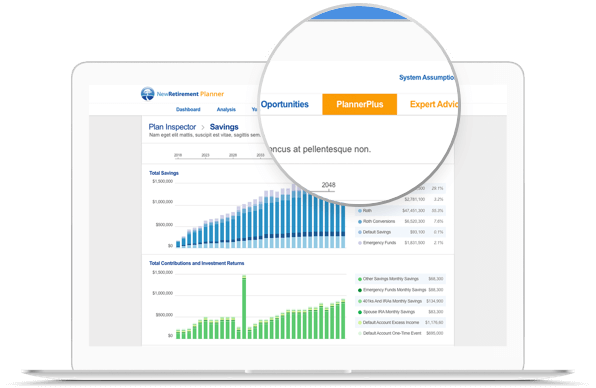 In addition to offering you the best FREE retirement planning tool available anywhere online, NewRetirement is developing PlannerPlus, a suite of premium tools for more advanced planning. PlannerPlus Coach: Retirement planning is complicated and it is critical that you avoid mistakes and examine every opportunity. Coach uses best practices and the power of technology to monitor your plan and alert you to big risks, oversights and opportunities to improve your finances. PlannerPlus Reporter: Print a personalized report or download annual values for all data elements in your plan. What is Coming Up Next for PlannerPlus? We are very excited about the great response we are getting to PlannerPlus and we know that there are a lot of additional tools that will help you feel great about your financial future. Up next is PlannerPlus Budgeter: Very soon you will be able to create a highly detailed budget. Document all of your expenses starting now and continuing throughout retirement. You will even be able to set desired and necessary spending levels. This level of detail will enable you to see much more realistic projections and give you invaluable insight into your retirement income needs. Tax Forecaster: Find out what you might owe and how to minimize future taxes. Withdrawals Planner: Model and discover the best way to position and drawdown your assets to maximize income and wealth. Asset Allocator: Tune your allocation based on your risk tolerance and needs and find opportunities to optimize your investment strategies. Subscribers are really happy with PlannerPlus. However, we know that it is a work in progress. So, if you subscribe now, you can get a special introductory rate and will lock in a 50% lifetime discount. This offer will only be available for a little while longer. The subscription will get more expensive when the next set of tools are delivered. Subscribe now for only $48 for the first year — with a full money back guarantee. Find out where you stand Login to the NewRetirement Planner.